The Web Applications Development Team at WMS is a bunch of skilled people who are acutely skilled at mobilizing AngularJS to all its potential. The unmatched expertise of our team paired with the amazingly proficient framework of AngularJS enables WMS in delivering intelligent, highly customizable and swift web application architecture with that compliments their business. AngularJS is the reinforced version of HTML for web application development, which enables the developers at WMS to develop powerfully dynamic apps. One of the top selling points of AngularJS is the data binding and dependency injection it offers, which eliminates the need to write line-and-lines of code. This incredible feature of AngularJS makes designing alluring UI’s and web applications, a piece of cake! AngularJS provides higher level of abstraction as compared to other frameworks used for web application development. 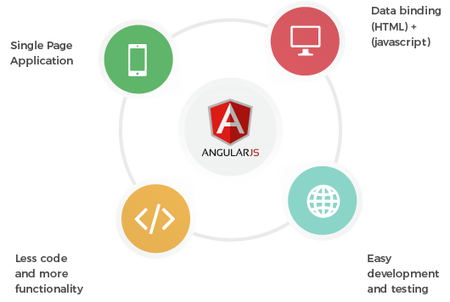 The superior provision of abstraction is one of the lynchpins which puts AngularJS at the rank of most efficient and easy-to-work with framework. The efficiency of a web application depends on its ability to operate at a great speed while following all its functionalities. Applications developed using AngularJS are unyieldingly fast, responsive and robust. AngularJS offers the power of rapid fata fetching which requires less server side scripting to be done. We invest our time in training for Angular JS developers and encourage our development team. If you have out of box app idea in mind then WMS Angular JS development team is always ready to work with you. Our development Angular JS team works hard to get maximum benefits of the framework. We offer reliable support and maintenance for mobile apps even after delivery. Being a trustworthy we offer to our clients, packages with enough flexibility and the most competitive rates. To help you at highly cost-effective rates as well as rapid site development. Just like Java technology, Angular JS is everywhere in the world! Ready To Create Angular JS Apps With WMS? Nobody understands Angular JS better than us and no body will be merrier in helping you create awesome applications for your business more than us. So pick up the phone and give a call if you want to harness the power of Angular JS Development!